This project addresses a fundamental ecological question: What mechanisms allow multiple species to coexist, when they seemingly depend on the same resources? Using a combination of field observations, manipulative experiments and mathematical modeling, my colleagues (Maureen Stanton, Dan Doak, and Truman Young) and I have been testing multiple mechanisms for species coexistence among a highly competitive guild of four acacia ant species that compete for Acacia drepanolobium host trees in the central highlands of Kenya. 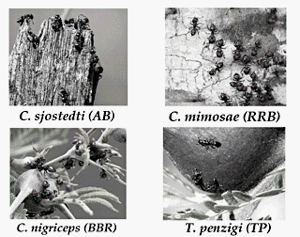 We have determined that a number of mechanisms operate to support coexistence within this guild (see publications page), and we are presently conducting longer-term studies of the effects of fire and temporal variation in rainfall on the acacia ant community. We are also developing mathematical modeling approaches to understand the quantitative contribution of different mechanisms to species coexistence, as well as the long-term effects of spatial and temporal variation in resource abundance on the acacia ant community.